CCH Pounder's NOLA The NCIS: New Orleans star shows Watch! around town. One of the best parts of playing coroner Dr. Loretta Wade on NCIS: New Orleans? According to CCH Pounder, it's getting to film in the Big Easy. "I've had the privilege of shooting all over—Los Angeles, Vancouver, Toronto, the South, the Caribbean," she says. "New Orleans is unique." Her ideal day in the city: "Early wake-up and walk in Audubon Park with no time constraints. Then a murder scene shot in a fabulous location like Oak Alley Plantation, the Whitney Plantation, or the courtyard of a French Quarter maisonette," she says. Unfortunately, that last part isn't an option for most of us, so we asked Pounder to share some of her other favorite things to do in NOLA. If my friend Frankie Roman doesn't make a mean mojito for me on Friday night—don't ask, 'cause you have to be invited!—I'll get cocktails at Restaurant Rebirth, and a great meal. Another neighborhood spot is Bullet's Sports Bar. Kermit Ruffins holds court Thursday nights, and you never know what musician will drop in and join the band. When I'm naughty, I'll go to Lil' Dizzy's Café in Tremé for some fried chicken and warm high-five welcomes. If I'm patient, Atchafalaya has a good brunch, and Patois is off the chain with great food, history, and stories, thanks to owner Leon Touzet. For seafood, it's Pêche on Magazine Street—I'm addicted. It's always crowded, but they will try to not disappoint and fit you in somewhere. Go shopping on Royal Street in the French Quarter or Magazine Street in the Garden District. Everything else you can pretty much find in your hometown, so hang with the artisanal stuff. 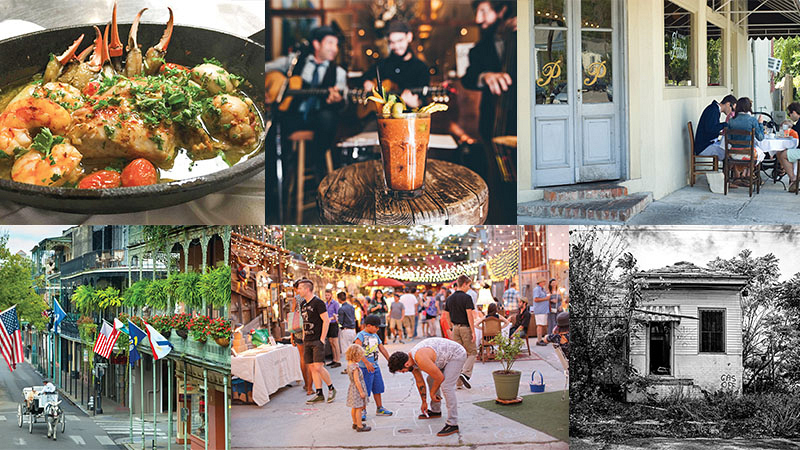 Late strollers will enjoy the nighttime Frenchmen Art Market on Frenchmen Street. Windsor Court Hotel is where I stayed and where I would recommend for its elegant, relaxed service. I'm here to work, so I don't need the thrill of a garrulous bar or an overflowing dining room. The rooms are comfortable, the service divine. SUBSCRIBE: For More Fascinating Interviews With Your Favorite Stars, Subscribe To Watch! New Orleans is about people! So stand in the middle of Frenchmen Street on any given night and take a picture of the endless stream of folks pouring in and out of all the music venues there. To see a second line [revelers who trail behind the "main line" of official parade participants] by chance, watch the riverboat Creole Queen pull away from the docks with her calliope playing. Or join a parade. Mardi Gras time you'll get beads thrown at you, but the real parade treasures to catch are the coconuts from the Zulus, the shoes from the Muses, and the bull from Rex. Should you see an impromptu parade of the Mardi Gras Indians, you'll kick yourself if you don't have your camera. A visit to the 9th Ward should be a requirement post-Katrina. I know you are coming for the booze, the imagined freedoms, the parties. But it's important to appreciate the survival instinct that New Orleans has. And I did not have to choose the 9th Ward; you can go Uptown, Mid-City, the Central Business District, or the Arts District, and you'll become aware of abandoned buildings. Churches falling apart. Schools in need of everything, including students. It should make you spend your money happily with small businesses and artisans, knowing that you're contributing to the ongoing recovery of this unique corner of the earth. By Yolanda Crous | Originally published in Watch! Magazine, September-October 2017. Photo Credits: Christine Rings (Pounder); Gary Hovland (Illustration); John Coletti/Getty Images (Royal Street); tyalexanderphotography/Getty Images (9th Ward). Watch all-new episodes of NCIS: New Orleans on Tuesdays at 10/9c on CBS and CBS All Access.